Troops of 7 Multinational Joint Task Force Brigade Quick Response Group (QRG) stationed in Baga and 118 Task Force Battalion, sprang an ambush along Daban Masara axis used by Boko Haram terrorists elements to convey logistics on Thursday. 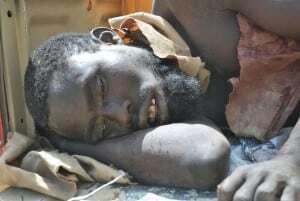 At the encounter, one of the suspected wanted Boko Haram terrorists leaders who is serial number 95 on the first Nigerian Army wanted list of 100 Boko Haram terrorists leaders, was fatally wounded in the exchange of fire. He later gave up while receiving medical attention at the base, while other members of his team escaped with gun shot wounds. The troops recovered 7 Jerri cans of 30 litres containing 210 liters of Premium Motor Spirit (PMS), motorcycles and food stuff in addition to arms and ammunitions.